Proponents of universal common ancestor evolution have a great deal of difficulty when it comes to explaining the intricacies of sight. You'll get a passel of speculations sans evidence and models, and even a dodge, such as, "The human eye is poorly designed, therefore, evolution". So, uninformed evolutionists want to deny the Creator, and inadvertently admit that evolution does a poor job of causing the eye to happen. Sure, Poindexter, keep deceiving yourself with that pile of bad science. Things do not get better for you. 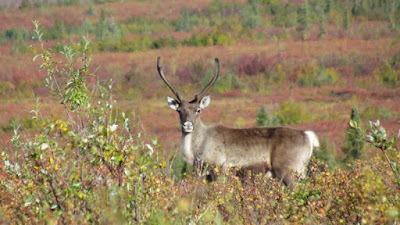 Way up yonder in the northern polar areas is a caribou (also called the reindeer) that has a neat trick: the eyes change color. No, not quickly, but in winter and summer. They have a golden hue in the summer, and blue in the winter. This is due to a complex arrangement of factors involving light wavelength, eye structure, reflectivity, and so on. We see again the failure of evolution to explain what is observed, and another testimony of the ingenuity of our Creator. It turns out the colour change is because the reindeer seasonally change the wavelength reflection from their tapetum lucidum (TL)—the reflective surface commonly known as ‘cat’s eye’ behind the retina. To read the rest of this short article, click on "Why reindeer eyes turn blue in winter".